In this tutorial, we will build an Angular 4 application using TypeScript. This article is published from the DNC Magazine for Developers and Architects. Download or Subscribe to this Free magazine [PDF] to access all previous, current and upcoming editions. So far, three major Angular versions have been released – Angular v1.x (a.k.a AngularJS), Angular 2 and the newly released Angular 4 (also known as Angular). AngularJS has had a few major releases of its own with v1.1, v1.2 and so on, but let us stick with v1.x for all purposes of discussion. Angular v1.x and v2 are quite different in terms of architecture. While Angular v1.x (also known as AngularJS) was based on an MVC architecture, Angular 2 is based on a component/services architecture. Considering Angular was moving from MV* (Model View Whatever) pattern to components focused approach, the framework features were very different from each other and caused many application developers to rewrite a major portion of their code base. However, Angular v2 to v4 is a very different story. It is a rather progressive enhancement. A majority of changes are non-breaking. Angular 4 was released on 23rd March ’17. What happened to Angular v3? MonoRepo: Angular 2 has been a single repository, with individual packages downloadable through npm with the @angular/package-name convention. For example @angular/core, @angular/http, @angular/router so on. Considering this approach, it was important to have a consistent version numbering among various packages. Hence, the Angular team skipped a major version 3. It was to keep up the framework with Angular Router’s version. Doing so will help avoid confusions with certain parts of the framework on version 4, while the others on version 3. - Angular 4 is compatible with TypeScript’s newer versions 2.1 and 2.2. TypeScript release helps with better type checking and enhanced IDE features for Visual Studio Code. The changes helped the IDE detect missing imports, removing unused declarations, unintentionally missing “this” operator etc. This article and the code sample demonstrates an Angular 4 application using TypeScript and Bootstrap 4. Please note that Bootstrap 4 is an alpha release at the time of writing this article. Angular CLI is a preferred way to get started with an Angular project (v2.x and above). It not only saves time, but also makes it easy to maintain the code base during the course of the project, with features to add additional components, services, routing etc. 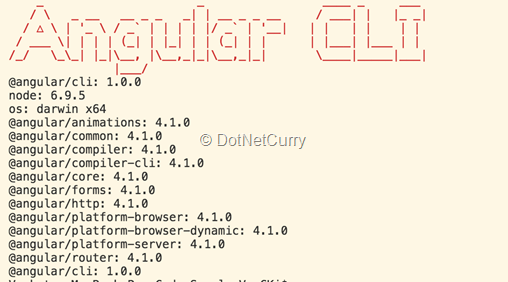 Refer to the appendix at the end of this article for an introduction to Angular CLI. Get Angular CLI at https://cli.angular.io/ . DinoExplorer is the name of the new project. You may optionally use --routing parameter to add routing to the Angular project. However, if you prefer to configure and install Angular and Webpack manually, refer to the Get started with Angular 4 (manual way) section in the appendix. The latest version of Angular CLI (v1.0) makes scaffolding possible with Angular 4. If you are using an older version, upgrade to Angular CLI. A new project created using Angular CLI now references Angular 4. Refer to figure 1. Scaffolding makes it possible to add new components, routes or services etc. from the command line. However, to upgrade an existing project to Angular 4, run following npm install commands which upgrades Angular and TypeScript on a Mac or Linux machine. We chose a specific version to ensure future releases doesn’t break the sample. Optionally, run the following command to install the latest pre-release package. Once the package is downloaded, add Bootstrap references in .angular-cli.json. Modify scripts configuration to add jQuery, Bootstrap and Tether JS files. Let us explore the Angular and Bootstrap features with the code sample provided with this article. It has three views. a. Basic: For demonstrating ng-template feature using *ngIf directive. More details described later in the article. 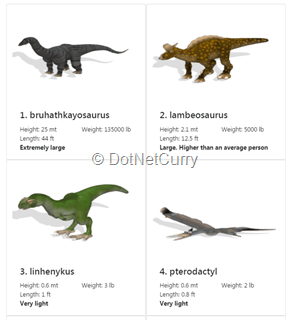 b. Dinosaur List: A home page that shows dinosaur list. The list is responsive using Bootstrap 4 (Alpha). Cards and the content inside align according to screen size. c. Random Dino: Randomly picks and shows a dinosaur card. By design, the response is delayed by four seconds. This is to simulate a loading message while an observable is asynchronously retrieving data. Visual Studio Code, an open source IDE from Microsoft, has good integration with TypeScript and Angular. With the new features in TypeScript 2.2, this IDE can detect missing and unused imports, missing this operator and also allows for quick refactoring. Editorial Note: If you are new to Visual Studio Code, here’s a productivity guide. The Visual Studio Code extensions’ eco system provides many useful features. Angular 4 TypeScript Snippets is one such extension. It’s a collection of snippets readily available for creating a component, service, pipe, module etc. Start typing “a-“ in VS Code, and it shows list of available snippets. See figure 3 for details on Angular artifacts that we can create with the extension. Imagine we chose to create a component. Tab through to provide component selector, template file name and component class name etc. The Component skeleton file is ready to use. This is an alternative to using Angular CLI for creating a new component. The following sections elaborate Angular 4 features and certain differences with Angular 2.x. If you are upgrading from Angular 2.x to Angular 4, all template elements have to change to ng-template. The following code will result in a warning. In TypeScript 2.0, a Strict Null Check option has been introduced. It restricts assigning null or undefined only to variables that are defined with that type. Strict null checks mode prevents assigning null to a number. sample.ts(2,1): error TS2322: Type 'null' is not assignable to type 'number'. However, this option is not fully supported yet. Angular doesn’t build with strictNullCheck enabled in tsconfig.json. When isTrue value is true, instead of showing the span inline, we could offload to another template. Consider a snippet from code sample below. It has three conditional blocks. - of extremely large size with greater than 10,000 pounds. 1. When it’s less than 100 pounds show #bird template. 3. When both the above conditions fail, show the #extraLarge template. While rendering an observable on a template, we can show loading message or a spinner gif with the *ngIf directive. Specify else template to show while async observable is not ready with data. The directive also supports creating a local variable. Notice a local variable dino (let dino) to refer to the async object. Consider following code. In the sample, to mimic delayed loading, the component calls next() on an observable subject after four seconds. In Angular 2.x, animations were part of @angular/core. It was part of the bundle even if the application never used animations. With Angular 4, animations related artifacts have been moved out of @angular/core. It helps reduce production bundle size. Refer to the major release schedule in Table 1. The details are quoted from this link (bit.ly/dnc-ang-release). Please keep a tab on the page for any changes to the schedule, considering it is still tentative. Bootstrap 4 is a rewrite of its previous version (v3). The newer version is built with SASS and it also supports Flexbox. One of the core features of Bootstrap is the grid system, which helps develop responsive layout. - In the new Bootstrap 4 grid system, the extra small (col-xs-*) breakpoint is modified to a width less than 576px. In the previous version (v3), anything less than 768 px was considered extra small. - Bootstrap 4, anything greater than 1200px is extra-large. This width was labelled large in previous version. As mentioned in the table above, the large breakpoint (col-lg-*) is now greater than or equal to 992px. To learn more about Bootstrap 4, refer to the articles Bootstrap 4 – New Features and Migrating from Bootstrap 3 to 4. It uses break points for extra-small (< 578 px), small (>= 576px) and large (> 1200px). It is applied on three dinosaur fields, height, weight and length. On an extra small screen, each field/div element takes up all twelve segments to show each field/div element in a row. On a small (and medium) screen, it takes six segments fitting two fields/div elements in a row and pushing the third field/div element to next row. On a large screen, each field/div element occupies four out of twelve segments. Hence it shows the three fields/div elements in one row (twelve segments in total). Our code sample follows a similar approach to align cards on the page. - It shows dinosaur cards in a single column on an extra small screen with col-xs-12; takes up all twelve segments. Refer to figure 4. 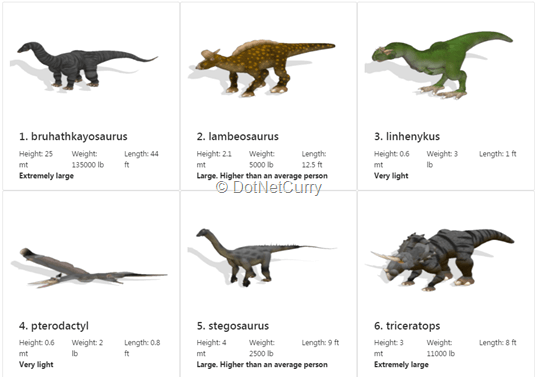 - Dinosaur cards are aligned to two columns on a small and medium screen with col-sm-6; takes up six segments, i.e, half a row. Refer to figure 5. - Dinosaur cards are aligned to three columns on a large and extra-large screen with col-lg-4, takes up four segments, i.e, 1/3rd of a row. Refer to figure 6. Angular went through a good amount of transition from Angular 1.x, MV* model, to the framework we know today. Angular CLI is an easy and effective way to get started with an Angular project (v2 and above). It scaffolds an Angular project with Webpack (or JSPM/SystemJS), TypeScript, unit tests’ skeleton, routing (optional) etc. During the course of the project, it also helps to add Angular artifacts to the repository. We can add components, services, directives, pipes, classes, guards, interfaces, enums and modules to the project. The tool is in line with Angular style guide. Consider the following steps to get started with an Angular 4 and Webpack (for bundling) incase you do not chose to go ahead with Angular CLI. i) Initialize an npm package with the following command. Provide values like package name, description, version etc. when prompted. iii) Webpack Configuration files: The webpack.conf.js is at the root of the project. It branches to three more configuration files a) webpack.dev.js b) webpack.prod.js and c) webpack.common.js. iv) Use the start script to run webpack dev server using dev configuration. Consider following script command. Subscribe to V Keerti Kotaru's thoughts on Twitter @keertikotaru or at LinkedIn.